$1 million spent on Wood Island in 2018. $2.2 million total so far! Maine Army National Guard was outstanding! Returning in 2019, June. After nearly 60 years of neglect, the Wood Island Life Saving Station is well on its way to restoration rather than demolition. A team of highly qualified contractors was selected through a public bidding process in the spring of 2016 and started the first phase of the project. Through that summer and fall they worked to clean the building of hazardous materials (asbestos, bird guano, lead paint) and repair the internal structure as well as much of the exterior. The building wasn’t completely restored in the summer / fall of 2016, but it has certainly was “saved”. It remained sealed up and wrapped in Tyvek paper waiting for windows / doors and exterior shingles in the summer of 2017. And come spring of 2017, that work began. By that fall the exterior of the historic station (windows, doors, shingles, trim) was completed and the place looked fantastic. In 2018, the Maine National Guard came to Kittery for the month of June and offered their free labor as an “innovative readiness training” exercise. 60 men and women worked seven days a week for 30 days and accomplished an amazing amount of work. They built the north sea wall, the historic shed and installed rough electrical and plumbing through out the Station. WILSSA coordinated the exercise by providing the permits, plans and logistical support of an 85 foot landing craft! 21 concrete trucks were transported (420 tons of poured in place concrete) as well as 400 tons of precast blocks and, roughly, 500 tons of earth and rock. 1500 tons in less than 30 days were moved! Amazing. This exciting news was all set in motion by the Kittery Town Council’s vote on January 25, 2016 to amend the October 16, 2013 “Repair Agreement” to provide WILSSA the opportunity to fully restore the Wood Island Life Saving Station. Also that night Council approved a “Concession Agreement” that allowed the building to be used as a maritime museum open to the public after it is restored. In February the National Park Service “Federal Lands to Parks” office in Boston rejected that version of the concession agreement as they had not yet provided their input in the process and wanted to make some minor changes. But meetings were held with the Town Council Chairman, Gary Beers, WILSSA and the NPS and an agreement between all three of those parties was reached in June and fully approved by Council, WILSSA and NPS in August 2016. This is enormous progress and has been in the works since 2011 when Kittery advertised a Request for Proposals seeking non-profits to repair the building at no cost to the Town and enter into a concession agreement to operate the Station for the benefit of the public. Since that time significant funding and permitting has been secured and spent, approximately $2.25 million in all. The work to save Wood Island Station is well on its way! That October 2013 agreement had called on Kittery to secure funding and permits for the clean up of hazardous materials found throughout the building and for WILSSA to raise funds and gather permits for the repairs to only the exterior of the building. On January 22, 2013, the Town submitted a $200,000 grant application to EPA for federal Brownfields funding to clean up the hazardous materials that the Town would match with $40,000. On May 28, 2014 EPA approved this grant request! On September 23, 2014 WILSSA submitted an application for $200,000 to the National Park Service’s National Maritime Heritage grant program. On April 27, 2015 the National Park Service approved this grant request! On February 23, 2015 the Maine State Legislature reviewed and approved LD 300 a bill to provide $200,000 for the repairs of Wood Island Station! Those funds were approved and became law on June 30, 2015. On April 21, 2015 the State of Maine Historic Preservation Office approved an application from WILSSA for the Station to be “eligible” for National Register listing. This assured the local building permits to do the repairs. 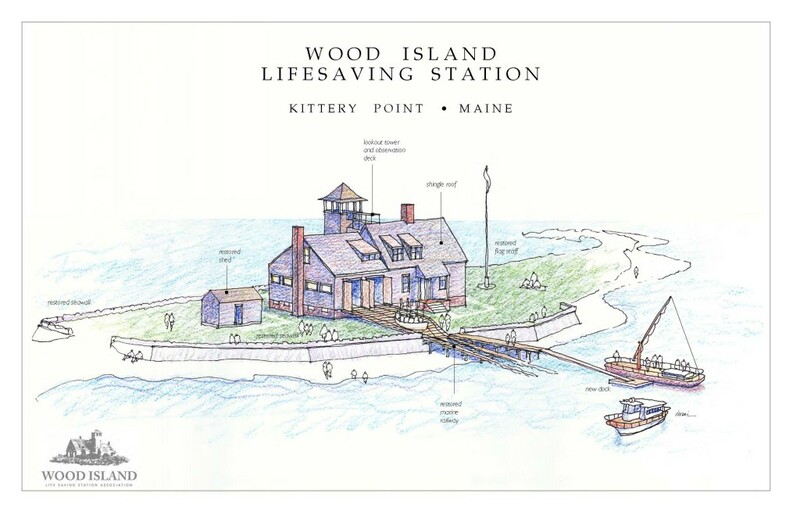 On August 10, 2015 the Town of Kittery disbanded its own “Wood Island Advisory Committee” (WIAC), approved a 20-year maintenance covenant to the property deed and authorized the Town Manager to begin discussions with the WILSSA President to create a concession agreement to allow the public to use a fully restored life saving station. On January 25, 2016 both a new Repair Agreement and a Concession Agreement were approved by Kittery Town Council. On April 8, 2016 a letter of intent was created between WILSSA and Chesterfield Associates agreeing to select them to finalize the details of the contract necessary to start work. The many specifics of the first phase of the project were advertised to the public in March and four teams bid the job. On June 3, 2016 a groundbreaking event was held in the parking lot of the Town Dock. A large crowd of friends and supporters of the project came together to hear a prayer from the minister of St. John’s Episcopal Church and watch Mrs. Barbara Hauck unveil the sign that displayed all of the many partners in the effort. By mid July the clean up phase of the work was completed and the restoration of the structure began. All asbestos was removed from the building’s exterior, between the subfloor and the finished floor and from the basement. Also, all plaster in the building was removed as it was covered in lead paint and mold. Through that summer and into the fall of 2016 the structure of the entire building was scrutinized and piece by piece it was repaired or replaced. Many loads of new timber were delivered to the island in dumpsters carried by Chesterfield’s 75 foot long Vietnam War era landing craft! Nearly 100 tons of materials were moved on and off the island in 2016. Through the summer and fall of 2017, Don Walden, a local contractor, worked hard to assemble a strong team of craftsmen to replicate the many small details of trim and shingle work. All new windows had been designed and constructed, all 49 of them. New doors to match the historic doors were also created. These were installed through the summer of 2017 and by the fall all of the extra thick 5/8” cedar shingles were in place. The exterior was fully restored! The Station will be restored to its former glory and opened to the public for their enjoyment. WILSSA will continue to work to fully restore the Station (both exterior and interior) at no cost to Kittery. WILSSA will also maintain the building for decades to come. WILSSA has proven that it can raise the money necessary to succeed with this project. WILSSA has also proven that it can take such funding and successfully accomplish the work intended; on time, on budget, with a perfect safety record. It has been an exceptionally successful 2016, 2017 and 2018 for Wood Island Station. Not only is funding for the repairs required of WILSSA but so too are the permits to do the work. The Town of Kittery confirmed that no permit was required for the clean up. The “eligibility” determination for National Register listing eliminated the challenge that the local building permits for the repairs would not be able to be secured. Local regulations say that if more than 50% of the value of a property is to be spent restoring it, then it becomes a new project, not a restoration. That means all current zoning regulations apply. For Wood Island, the building is too close the shore with too small a lot. Without the historic designation, the project would not have been able to begin. State and federal permits were required for the site work, the repairing of the sea walls, the area around the Station and a dock. As of December 2015 those permits had been approved by the Maine Department of Environmental Protection (DEP) and the US Army Corps of Engineers. These were complex permits and an expensive processes that required more than 14 months to finalize. Through the summer of 2016, the Kittery Port Authority received an application for the dock and marine railway permits from WILSSA. Hearings were held as well as a site visit. Those permits were approved in September. Through the fall and winter of 2017 / 2018 the Kittery Planning Board reviewed an application for Wood Island Station. After five months of work, the finished product was completed on January 11, 2018. The many elements that WILSSA had requested were all agreed to. The building will be able to be rented out. People will be allowed to spend the night. The Station will be open to the public as a maritime museum. In December of 2015, Kittery’s Town Manager and WILSSA traveled to Augusta to meet with the Maine National Guard and learn more about their “Innovative Readiness Training” program. A formal application was crafted for the Guard to consider coming to Kittery in the summer of 2018 and help with some electrical and plumbing work. The Kittery Town Council voted in December of 2015 to authorize the Town Manager and WILSSA to submit that application and it was provided in draft form to the Guard in early 2016. In March of 2016, WILSSA returned to Augusta to meet with the Maine Guard again. It was learned that the first reviews of the draft application (scope of work, schedule, budget) had all been successful. But the Maine Guard had a new idea. They encouraged WILSSA to apply to the Department of Defense for Innovative Readiness Training assistance as well as the Maine Guard. Those two applications were approved by the Kittery Town Manager and forwarded to the Pentagon and Augusta in September. By November that application had been posted in the internal DOD web page for IRT projects nationwide. In the early part of 2018 the Maine Guard took the lead in responding to the request from WILSSA / Kittery. Through the spring coordination and planning was in high gear and by June the Guard arrived in huge numbers. 60 soldiers stayed in tents at Ft. Foster and provided exceptional labor and equipment. They rebuilt the massive north sea wall and the historic shed and installed rough electrical and plumbing services working seven days a week for the entire month of June. We look forward to welcoming them back in June 2019 to take on the rebuild of the south sea wall. When will all of the restoration work be completed? That will depend on additional funding. A fully restored Station could be open to the public as early as 2020. This is a very exciting time for the Wood Island Life Saving Station in Kittery Point, Maine. The Town of Kittery owns Wood Island and its historic Life Saving Station. This building was built in 1907 and opened in January of 1908. It was used until 1948 as a place for men and their boats to assist mariners in distress off of the coast on Maine and New Hampshire. During WWII it was used by the US Navy to watch for Nazi submarines prowling the coast. In 2012 it was placed at the top of the list of “Most Endangered Historic Properties in the State of Maine” by the leading statewide historic preservation group, Maine Preservation. When a Committee formed by the Town (the Wood Island Advisory Committee or WIAC) proposed demolition of the Station to Town Council in 2009, local citizens began to gather and ask why. The Town had been given the property for free by the National Park Service in 1973 but had not maintained the Station for many years. It had never been open to the public. Demolition seemed to be such a poor and expensive answer. From Kittery’s perspective, the approximately $250,000 cost to demolish it was too large to afford. Not only could they not afford to tear it down and they also couldn’t afford to restore it. Kittery was in a tough spot. They needed help. After some public listening sessions and substantial back and forth about how to proceed, in September of 2011 the WIAC recommended to Council that a request for proposals (RFP) be advertised to create a long-term concession agreement with a 501 c 3 non-profit to operate the Station for the benefit of the public after the non-profit paid for a renovation. WILSSA was established to respond to that RFP and was the only group to reply. In only 36 days WILSSA registered with the State of Maine as a non-profit corporation, filed an application to be a public charity with the IRS, formed a partnership called a “fiscal agent agreement” with Museums of Old York, drafted by-laws, secured board members, hired an accountant and an attorney, and wrote its detailed proposal to respond to Kittery’s request. The Association’s plan then remains the same today; to restore and reuse the Station for the public as a maritime museum open seasonally for education and enjoyment. There will be no cost to the Town of Kittery for the restoration. There will be no cost to the Town of Kittery for the ongoing maintenance. In March of 2012 Kittery Town Council selected WILSSA’s and its proposal in concept by approving a memorandum of understanding (MOU) with WILSSA laying out the process ahead and the general ground rules. The Town agreed in that document to apply for a Brownfields grant from EPA to pay for the approximately $200,000 cost to clean the building of asbestos, bird guano and lead paint. WILSSA promised in the MOU to provide additional detail to their proposal regarding the costs of the restoration. Both parties agreed to continue to work on finalizing the two contracts to formalize the project. That clean up of the asbestos and bird guano required removing the shingles on the sides of the building and pulling up much of the flooring. In 1908 when the Station was built, siding paper was asbestos! Asbestos was also used in between layers of the floors. It was used to wrap the pipes for the heating system throughout the building too. Since many of the window sashes have been missing for years, birds had entered the building to nest and toxic bird guano covered the floors inches deep. Lead paint was also used throughout the building. WILSSA proposed to start its restoration work as soon as the “all clear” was given after the clean up. The first phase of the restoration made the structure new again. In 2016 even a new roof was installed. New exterior shingles and doors and windows were installed in 2017. The building is in excellent condition but has not interior finished walls or floors. There is also no electrical or plumbing systems in place. The primary reason that Wood Island Station came to a head in recent years is the persistent, written reminders from the National Park Service that the deed it created with Kittery when the federal government gave the property to the Town in 1973 included a provision that the island remain open to the public. Since the building had deteriorated and the asbestos and unstable structure were in the middle of a small island – a public park – the island had become dangerous to the public. The Park Service, in 2010, instructed Kittery in writing to close the entire island because the building was such a hazard! WILSSA created blue prints and detailed specifications for the restoration of the building’s exterior and interior after a number of visits to the National Archives in Washington DC had located the original floor plans. In the summer of 2012, with Kittery’s approval, WILSSA solicited bids from contractors through a public process for not only that first phase, to repair the structure and clean it of all hazardous materials, but also for the complete restoration of the interior. Eight firms toured the site and four responded to the details laid out by architect Deane Rykerson. Three of the bids were very close in price at approximately $350,000 for the clean up / structural work and the same amount for the interior work. But the work on the building is only roughly half of the entire undertaking. Kittery’s WIAC requested a plan for the restoration of the site around the Station. So WILSSA hired the marine engineer, Duncan Mellor, to create that plan. The seawalls protecting the Station had deteriorated in recent years and a portion of the island around the Station, especially on the north side, had eroded significantly. The engineer created a detailed plan for a new sea wall and restoration of the area around the building with new stone, roughly 1000 cubic yards in total. Bids were requested by WILSSA from contractors through a public process for this work and three bidders responded in the fall of 2012. A cost range between $111,000 and $200,000 to construct this plan was found depending if the rock was provided free or not. Productive meetings with WILSSA, the Kittery Port Authority, and the US Army Corps of Engineers were held regarding the notion of using rock from a proposed dredging project in the Piscataqua River to rebuild Wood Island around the Station. That dredge rock could be provided to the island free of charge by the Army Corps. But the timing of that project remained uncertain so WILSSA began to look for other sources of free rock and also began to consider rebuilding the concrete sea walls entirely out of precast concrete block. On November 20, 2012 WILSSA provided budgets to WIAC that combined the restoration of the building, the rebuilding of the seawalls, and the hazardous materials clean up. On that day WILSSA also provided the detailed architectural drawings for the building restoration and the sea wall / site work. The bid documents and responses from contractors were included along with a time line to complete the project called the Plan of Action and a Cover Letter describing all of the materials. What is more, WILSSA sent to Kittery’s WIAC new versions of the renovation and concession agreements. WILSSA had also begun to plan for the exhibits that the maritime museum will display. Like at Fort McClary, interpretive signage telling the story of the Life Saving Station’s “Surfmen”, the US Coast Guardsmen who followed them and later the US Navy men who watched for German submarines during WWII were proposed to be created. The local support for this project has been impressive. For example, on Election Day 2012 WILSSA set up a table at the Kittery Community Center and gathered more than 500 signatures on a petition. That petition said “I support the WILSSA plan to save the Wood Island Life Saving Station.” WILSSA presented this petition for restoring and reusing the Wood Island Life Saving Station to the WIAC knowing that the Station had been recently designated the “Most Endangered Historic Resource in the State of Maine” by the State’s leading historic preservation organization – Maine Preservation. Unfortunately, the Town of Kittery experienced a crisis of leadership with the resignations of the Town Manager and the Chief of Police both on December 10, 2012. Although the reasons for their departures did not relate to this project, this sort of confusion in the Town government’s leadership created additional delay in allowing WILSSA’s proposal to be discussed. It wasn’t until February 2, 2013 that WIAC met with WILSSA to review the materials that were forwarded in late November 2012. Although WILSSA repeatedly requested meetings with the WIAC, months passed with no response as Kittery reeled from the twin resignations. At that February meeting, WIAC was favorably impressed by the presentations from the marine engineer and the architect for the sea wall and building work. They also were impressed with the level of detail in the bids that had been submitted to undertake the restoration work. There was agreement that WIAC would begin to review the draft concession agreement and the renovation agreement and provide their edits and comments to WILSSA. These contracts were needed to take the plans and bids for restoration and reuse to reality. On March 3, 2013 their edits for the concession agreement arrived. WILSSA responded by asking for their comments on the renovation agreement also. The concession agreement included various provisions that were based in the renovation agreement and the two needed to be considered together, WILSSA emphasized. Soon thereafter, WIAC responded by saying that they were ending this process entirely and recommending demolition of the Station to Town Council immediately. That notice came by email, as WIAC had consistently refused to communicate with WILSSA by phone. It arrived at 1:00 PM on March 25, the same afternoon as a 7:00 PM Town Council meeting. WILSSA immediately drafted a letter that was hand delivered to each Council member that evening describing the Working Group’s faulty conclusions. That letter and WIAC’s email recommending demolition are available here; http://tinyurl.com/lo54cz6 WIAC recommended demolition of Wood Island Station to Council that night but Council did not take any action. A phone conversation with the Town Council Chair, George Dow, on the follow day confirmed that the various concerns described by WIAC about the project were readily addressed in the renovation agreement – the same document that WIAC refused to review. Council Chair George Dow, a regular attendee of WIAC meetings, admitted that he had never read the draft renovation agreement even though he had supported the demolition recommendation at Council on March 25th. Why WIAC refused to review all the materials provided on November 20th was hard to understand. Why they described their concerns with the project as though WILSSA had not addressed them, in writing, many months before, was even more difficult to grasp. Council discussed this letter at their meeting on April 8 and agreed to host a workshop. On April 13, WILSSA met again with Kittery’s WIAC. There was little discussion about the draft contracts – but the workshop with the Council was scheduled for May 29 at Town Hall from 6:00 PM to 7:00PM. WILSSA worked hard to spread the word about the “Rally for Wood Island” on the 29th of May 2013. Local artists created posters and put them up throughout Kittery. Media coverage was extensive and there was even a rally in the traffic circle before the event with volunteers holding signs saying “Honk to Save Wood Island.” The meeting was very well attended. The Kittery Fire Marshall expressed concern about the capacity of Council Chambers. The two petitions said 1) No Town funds will be spent on Wood Island besides the match for an EPA Brownfields grant and 2) The island will be transferred at no cost to WILSSA in exchange for a permanent open space easement guaranteeing public access to the island in perpetuity. WILSSA spent the next few weeks at events such as Market Square Day (June 8), Kittery Ballot Day (June 11) and Kittery Block Party (June 15) gathering approximately 850 signatures on both of the petitions even though only 400 were needed to create a Special Election. A clear choice was described. Either spend an estimated $250,000 of town funds to clean and then demolish the historic station or apply to EPA for federal funds to clean the hazardous materials and allow WILSSA to raise the money to restore the place at no cost to the Town. In either a demolition or restoration scenario the building must be cleaned of the asbestos, bird guano and lead paint as state and federal law requires the clean up. 850 petitions were presented to Kittery within two weeks and the signatures were confirmed by the Town Clerk as valid. The Town Council, unfortunately, soon thereafter hired an attorney to draft a one-page letter saying that the substance of both of the petitions were “illegal”. At another very well attended public meeting on July 9, 2013 Council voted unanimously to toss out the hundreds of petitions and not to schedule a Special Election. Naturally WILSSA and many Kittery citizens disagreed with this opinion. Again the room was packed. Again there was a protest in the Kittery traffic circle. This time it was all carried live by television news stations from Portland. A small mountain of letters between attorneys was created. But even though the petitions and the Town Charter were, in WILSSA’s opinion, ignored, the local support for them was impossible to overlook. 850 residents had signed them and that fact was irrefutable. WILSSA began reaching out one on one to members of Town Council and in a series of quiet meetings through the summer, found a new path forward. That new approach meant that Kittery would no longer be recommending demolition, but they would also not be providing a long-term concession agreement – at least not yet. The agreement was to postpone discussions about what will go on in a restored Wood Island Station until after Kittery secured the clean up funding and WILSSA found the funds and permits for the repairs to the building’s exterior only. This agreement was finalized in a “Repair Agreement” that was passed by Town Council on October 16, 2013. Importantly in that agreement, the EPA clean up grant could not be spent by Kittery until WILSSA confirmed that it had raised the funds necessary for the exterior repairs. The clean up and repair needed to be closely coordinated to preserve the building. WILSSA would be in control of the repair work and therefore would coordinate the timing of the clean up led by Kittery. WILSSA felt that this compromise was a good one that would help ensure the restoration of the station. What would go on in the station after the restoration of the exterior would be a subject of discussion at a later date, but first WILSSA needed to prove it could perform with raising funds and securing permits. In the weeks following November 22, 2013 when the EPA announced their 2014 Brownfields application process, WILSSA and Kittery’s staff worked well together. The Town Manager, Nancy Colbert Puff, had a master’s degree in historic preservation. The Brownfields application was an impressive one with significant support from many citizens, organizations and elected leaders. WILSSA drafted nearly all of the Brownfields application, made sure that it was completed by the deadline, lined up all of the letters of support, and then worked hard to communicate with EPA leadership through the Maine congressional delegation and through one on one meetings with senior EPA officials. The Governor, both US Senators, both members of Congress from Maine and a long list of leading non-profits locally, regionally and nationally wrote in support. WILSSA was so pleased that the EPA grant application was approved. The $200,000 from EPA was to be matched by $40,000 from Kittery. The $240,000 was expected to be sufficient to pay for the entire clean up. Through the spring and summer of 2014, additional strong progress was made. Kittery agreed to allow temporary repairs to be made by WILSSA to install scaffolding to hold up the section of roof that was collapsing. That work occurred in mid July and was paid for in full by WILSSA. The permitting for the clean up was approved by Kittery and permitting for the exterior repairs was discussed with the Kittery Code Enforcement Officer over a period of months. The Kittery Zoning rules, however, remained a serious challenge. There is wording that says a “substantial reconstruction”, defined as more than 50% of the value of the structure, means a building needs to come up to modern building code. Wood Island Station had little or no value as it was filled with hazardous materials and was in poor condition. Restoring it would certainly cost more than 50% of its minimal value. What is more, it couldn’t come up to modern code because it is far too close to the water and the island, the lot, is too small for the building. An exception for the substantial reconstruction rule, however, would be available if a building was formally designated “historic” by the State of Maine. Wood Island Station, however, had twice been rejected for that designation by the Maine State Historic Preservation Office because of the building’s poor condition of repair. Resolving this issue presented a serious challenge for the entire undertaking. On August 9, 2014 WILSSA hosted a “Flotilla” that was a parade of more than 30 boats and 200 people from Pepperrell Cove out to Wood Island and back. All mariners of the seacoast region were encouraged to follow along behind the Gundalow Piscataqua on an afternoon sail to show support for restoring the Station though a really fun poster that was created free of charge by the local artist Bob Nilson. 150 of the posters were spread over the surrounding communities. The weather was good and the press coverage excellent. On September 23, 2014 WILSSA submitted a request to the National Park Service and their National Maritime Heritage grant program for $200,000 to repair the exterior of the Station. That application also had the Governor, both US Senators and both members of Congress from Maine and an impressive list of leading non-profits writing strong letters of support. WILSSA worked hard in Washington DC to lobby for its approval. This grant program it is ideally suited for this project. It specifically lists life saving stations as eligible for the funding. What is remarkable is that the program had existed since the late 1990s, but had only awarded funding for grants once. The fact that the program announced that a new round of grants would be made at exactly the time that Wood Island was seeking funding was extraordinary. These funds needed to be matched by WILSSA dollar for dollar and together with the Brownfields grant, would be sufficient to clean the building and repair the exterior. In other words, with a successful Park Service grant and match the funding condition of the agreement from October 2013 would be met. That could allow the conversation between Kittery and WILSSA about next steps for restoring the interior of the building and the future use and maintenance of the Station to begin. It was big news when the National Park Service awarded the $200,000 to WILSSA in April of 2015. Legislation from the State of Maine to pay for an additional $200,00 in matching funds for the Park Service was filed in January of 2015. LD 300 was the number of the bill and it enjoyed unanimous and bipartisan support in the Education and Cultural Affairs Committee. Representatives of WILSSA traveled to Augusta to testify in support of the measure on February 23 along with the three leading sponsors; Senator Dawn Hill, Rep Deane Rykerson and Rep Bobbie Beaver. Soon thereafter the bill was voted out of committee with unanimous support. In April of 2015 the bill was approved by both the full House and full Senate. It was included in the budget of the State of Maine in late June and passed into law on June 30. Although various concerns had been expressed over the years by Kittery and WIAC about restoring and reusing Wood Island Station, all of the largest concerns from the past had been addressed. Most important of these was Kittery’s ability to secure the Brownfields funding and WILSSA’s ability to raise the funds to restore the exterior of the Station and repair the site. Combining the EPA the Park Service and the State of Maine money with private dollars raised by WILSSA totaled $740,000. This was exceptional progress in the 16 months since the October 2013 agreement was signed. No reference to maintenance, however, was included in the October 2013 “Repair Agreement.” Kittery had repeatedly expressed no interest in paying for the upkeep of a restored life saving station on Wood Island, and their track record of neglected maintenance in the past excluded them from any serious discussion about responsibility for the newly restored asset going forward. WILSSA, as the recipient the National Maritime Heritage grant from Park Service, was required to have a long-term (20 year) maintenance agreement between the property owner (Kittery) and the State of Maine to receive the funding. WILSSA, however, still expected to be the one to pay for the maintenance. Therefore, WILSSA needed to be able to create income from visitors to a fully restored Station to pay for that ongoing matinenance. That would be a win / win for all. 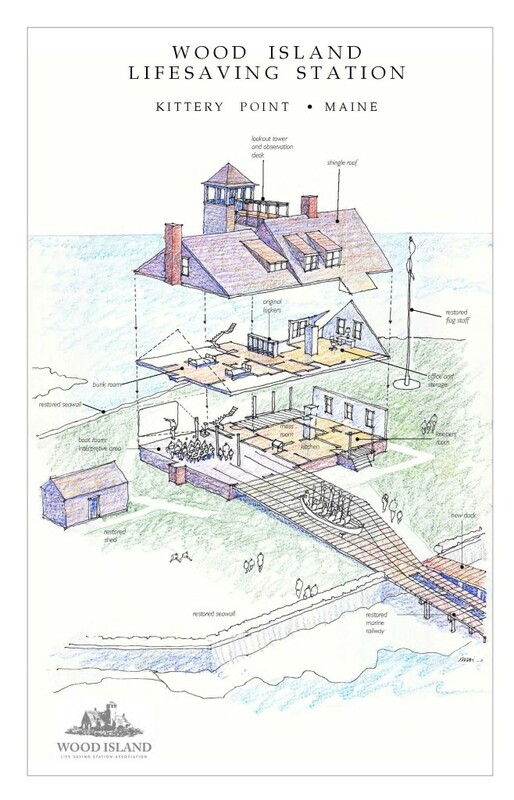 Paying a fee to visit the restored life saving station at Wood Island would be the best outcome for the building and an excellent result for Kittery’s taxpayers. It will also create jobs and provide another destination in Kittery for visitors and residents to enjoy. The Kittery Town Council, on August 10, 2015, approved a 20-year maintenance covenant to the deed and took responsibility for maintenance of the restored exterior of the Station. This responsibility was passed along to WILSSA in the new Repair Agreement finalize on January 25, 2016. At that August meeting, the Town Council also voted to disband their own advisory committee, WIAC, and allow the Town Manager and the President of WILSSA to work one on one to finalize the new Repair Agreement and a Concession Agreement. This was enormous progress that WILSSA was very pleased about. The funding condition for the October 2013 agreement had been met, and so too had the permitting condition. On April 21, 2015 the Maine State Historic Preservation Office approved an application from WILSSA for the building to be “eligible” for listing on the National Register of Historic Places. The drafting of that application brought together leading national experts on life saving stations. On March 11 a delegation of historic preservationists traveled to Augusta to meet with the Maine SHPO staff and make their case for “eligibility”. It was a challenging discussion because the SHPO had twice (in 1986 and in 2005) rejected similar applications. But the detailed research and the persuasive arguments of the life saving experts were convincing. For example, two other similar life saving stations have been restored by the National Park Service in recent years. The Park Service created extensive documents describing those restorations called “Historic Structures Reports.” For one of them they also created a “Historic Furnishings Report.” That information has helped act as a road map for restoring the Wood Island Station. Also as part of the research of Wood Island, the original heating plan, septic plan and structural plans for the building and marine railway have all been located. The details of exactly what boats were stationed at Wood Island have been gathered. The service records of every person who served there is available. The daily logs for the Station have been found and reviewed. Every time an emergency occurred a “Wreck Report” was generated. All of those reports have also been located and photographed. This quantity of primary material is impressive and continues to grow. Wood Island Station is a “Duluth Type” which is a specific architectural design first built in Duluth MN in 1894. There were only 28 of them ever constructed, and only 12 remain. In Maine there are 2 such Duluth Type stations, including Wood Island. Wood Island Station is not only of a rare architectural type, but it is very special because the site of that small island was used in a unique way. Instead of the doors to the boat room facing towards the ocean on the same side as the watch tower, as is done in every Duluth type station – and in every life saving station of any design – Wood Island’s boat room doors open to the rear of the building. This is because the water to the north is more protected than the water to the south. This is the only life saving station that has such a design. What is even more noteworthy, through the research for that application it was learned for the first time that Wood Island Station is the last remaining life saving station of any design anywhere in the USA that has a marine railway. Obviously restoring not only the station but also the marine railway, which is WILSSA’s intent, would be a very rare and exciting thing. It is fair to say that original research that moved the body of knowledge of life saving stations forward was generated by this application. It was an excellent work product. And the more we learn about Wood Island Station, the more we find how special and important it really is. The “eligibility” designation meant that the local building permit problem had been resolved. The “substantial reconstruction” issue was removed. It also meant that the flood insurance required by the National Park Service funding would be far cheaper. Through the fall and into the winter of 2015 the Town Manager and WILSSA President continued to do two things; work on the bid package for the work of the clean up and the repair and try to finalize drafts of a new Repair Agreement and a Concession Agreement. A site visit was hosted on October 6 for contractors interested in the project and they were encouraged to submit their qualifications. Also, drafts of the Repair and Concession Agreements reached Town Council in time for their December 14 meeting. At that time, however, a “legal review” was sought by the Council. That review missed its deadline of January 11 Council meeting and barely was ready for the January 25 meeting. But at the January 25 meeting, Council was presented with two competing choices. A version of the documents from the Town’s Attorney, Duncan McEachern, and version of the documents from WILSSA. After significant support was given by residents during that meeting and after showing that the concerns of the attorney were not significant, the Council voted to pass both contracts supported by WILSSA 4 – 3. It was a close vote and a disorganized process, but thanks to a majority of the Kittery Town Council, WILSSA came through with the contracts it had requested. And the timing of that vote was critical. Without approval that night there would have been no way to advertise the bid package to the public and be ready to start the work in the spring. Without a spring start, the amount of time necessary to do the work would have run out before the heavy weather of fall arrived. The contractors were selected and the project ran from early June to mid October. The clean up was successful and showed that the condition of portions of the building were even worse than had been expected. Sills had to be replaced in approximately half of the building and the entire boat room roof was replaced with new timber. But many pleasant surprises also occurred. The foundation was in fine condition, most of the largest timbers in the structure were able to remain in place and even some original window frames and doors were found in the attic. In the fall of 2016 WILSSA applied again to the National Park Service for another $200,000. WILSSA also applied for assistance to the Maine National Guard and the Department of Defense. The exterior work was completed in the summer of 2017 with new windows, doors and exterior shingles being installed. But it almost did not come to pass. The new Trump administration was slow to release their decisions about funding from the National Park Service. In 2015 the announcements had been made in April. But April of 2017 came and went with no indication of funding. WILSSA had managed to raise the required match of $200,000 from Kennebunk Savings Bank ($25,000) the Davis Family Foundation ($25,000) and an anonymous donor ($150,000). But without the $200,000 from Park Service, or some other source, there could be no work begun in 2017. It all came to a head in a most unlikely fashion. Tom Haas is a philanthropist who had heard of the Wood Island Station project and expressed interest in visiting and learning more. He came to visit on May 8, 2017. The following day a site visit was planned for interested contractors willing to bid for the work. With great humility, Tom asked if he could help since the Park Service $200,000 had been delayed. He offered to pay for the needed $200,000 on the spot. The site visit went ahead as planned and a contractor, Don Walden, was soon selected to get to work. A total of $450,000 was raised and spent in 2017 bringing the total expended on Wood Island’s restoration to $1.2 million. That application to the Park Service, ultimately, was rejected. So the fact that Tom Haas assisted when he did became even more significant. For 2018 WILSSA applied again to Park Service for $200,000 and also applied to the Pentagon and Maine National Guard. The intention is to have the Maine Guard come to Wood Island and rebuild the north sea walls, the historic shed and install rough electrical and plumbing in the building. WILSSA would need to provide the materials and the Guard would provide their valuable labor free of charge. Tom Haas returned in October 2017 to see the progress that his generosity had allowed. He was really pleased to see the exterior looking brand new. He was also pleased that WILSSA had managed the project to within a few thousand dollars of its intended capital budget of $400,000. The windows, doors and shingles all installed as well as WILSSA’s ability to perform so professionally showed him that his decision to help WILSSA out of a jam had been a good one. He offered to help with additional funding. A new grant from Tom Haas for $250,000 was announced in February of 2018. This timing was critical as the many materials needed for the Guard would need to be purchased. WILSSA had finalized the design using Duncan Mellor for the north wall. It will have 270 blocks each weighing 3200 pounts. Another 630 tons of rock (353 cubic yards) will be used behind the wall to rebuild the north area of the island that has been lost to erosion. Of course, the logistical challenge of transporting approximately 1000 tons of rock and block is something that is quite daunting. But it is also a really fun thing. Also planned for the Maine Guard is the work to rebuild the historic shed that will be used for a generator to power the electrical needs of the Station as well as a handicapped accessible bathroom. The Guard will install the electrical and plumbing systems for the buildings in June of 2018 as well. The many last details of the approval for the project were secured through the fall and winter of 2017 / 2018 from the Kittery Planning Board. Although not a smooth process, there was strong consensus among the Board that Kittery’s Building Code allowed for the Station should be used as a maritime museum for the public. They also agreed that Code permitted overnight stays and that the Station could be rented. In short, all of the complex elements of the January 25, 2017 Concession Agreement have been reviewed and confirmed by the Kittery Planning Board. With a few small exceptions, there are no more permits needed to fully restore and reuse Wood Island Station. If the Park Service approves in the spring of 2018 the $200,000 grant requested then WILSSA will construct the pier in the summer of 2018. The final design for the pier is completed and all permits for that work are in hand. Still to come, of course, is a rebuild of the south sea wall, the construction of the marine railway and the finishing the interior of the building. The Maine Guard has already confirmed that they are standing ready to return in the summer of 2019 and take on as many of these tasks as time and WILSSA’s ability to provide materials for will allow. So, obviously, additional sources of funding will be needed in the days ahead to allow that to happen. But it is wonderful to know that the remaining hurdle to a successful project is money only. Raising the last of the capital needed won’t be easy – but the challenges of stopping the demolition, finalizing the complex contracts with Kittery, raising the funds secured to date, and then actually doing the work of restoring the building are all behind us. The value of the Guard’s labor in 2018 is estimated at $500,000. The value of the Guard’s labor in 2019 is estimated at $300,000. Added to the most recent grant of $250,000 from Tom Haas and the $1.2 million raised since October 2013 – the total available to WILSSA now equals $2.25 million. The total cost of the restoration is becoming more and more clear and precise as we gain experience with the project. That total is expected to be $2.8 million. Can an additional $600,000 be raised in time to finish the work and open the building in the summer of 2019? Well, if the National Guard grant for $200,000 comes through, the finish line will be clearly in view. Wood Island Station will be restored fully, opened to the public, and maintained at no cost to the taxpayers of Kittery. WILSSA will have relieved Kittery of a serious liability while creating a real benefit for the community for years to come. And along the way, we have all come to understand how special Wood Island Station really is. The hard work of saving Wood Island Station will soon be on display in a lovingly restored historic life saving station with a functioning marine railway and replica rescue craft. If we are exceptionally fortunate, this restoration can be completed in the early summer of 2019 and the building open to the public in the late summer of 2019. Our hope is that this historic preservation success will encourage others in Kittery to cherish and preserve the many other historic properties in our community that are, from time to time, in jeopardy. In March of 2012 Kittery Town Council selected WILSSA’s and its proposal in concept by approving a memorandum of understanding (MOU) with WILSSA to lay out the process ahead and the general ground rules. The Town agreed in that document to apply for a Brownfields grant from EPA to pay for the approximately $200,000 cost to clean the building of asbestos, bird guano and lead paint. WILSSA promised in the MOU to provide additional detail to their proposal regarding the costs of the restoration. Both parties agreed to continue to work on finalizing the two contracts to formalize the project. But the work on the building was to be only half of the entire undertaking. Kittery’s WIAC requested a plan for the restoration of the site around the Station. So WILSSA hired the marine engineer, Duncan Mellor, to create that plan. The seawalls protecting the Station had deteriorated in recent years and a portion of the island around the Station, especially on the north side, had eroded significantly. The engineer created a detailed plan for a new sea wall and restoration of the area around the building with new stone, roughly 1000 cubic yards in total. Bids were requested by WILSSA from contractors through a public process for this work and three bidders responded in the fall of 2012. A cost range between $111,000 and $200,000 to construct this plan was found depending if the rock was provided free or not. The Kittery Zoning rules, however, remained a serious challenge. There was wording that said a “substantial reconstruction”, defined as more than 50% of the value of the structure, meant a building needs to come up to modern building code. Wood Island Station had little or no value as it was filled with hazardous materials and was in poor condition. Restoring it would certainly cost more than 50% of its minimal value. What is more, it couldn’t come up to modern code because it was far too close to the water and the island, the lot, was too small for the building. An exception for the substantial reconstruction rule, however, would be available if a building was formally designated “historic” by the State of Maine. Wood Island Station, however, had twice been rejected for that designation by the Maine State Historic Preservation Office because of the building’s poor condition of repair. Resolving this issue presented a serious challenge for the entire undertaking. WILSSA, as the recipient the National Maritime Heritage grant from Park Service, was required to have a long-term (20 year) maintenance agreement between the property owner (Kittery) and the State of Maine to receive the funding. WILSSA, however, still expected to be the one to pay for the maintenance. Therefore, WILSSA needed to be able to create income from visitors to a fully restored Station to pay for that ongoing matinenance. There was a need for a formal operating agreement. The Kittery Town Council, on August 10, 2015, approved a 20-year maintenance covenant to the deed and took responsibility for maintenance of the restored exterior of the Station. This responsibility was formally passed along to WILSSA in the new Repair Agreement finalize on January 25, 2016. At that August meeting, the Town Council also voted to disband their own advisory committee, WIAC, and allow the Town Manager and the President of WILSSA to work one on one to finalize the new Repair Agreement and a Concession Agreement. This was enormous progress that WILSSA was very pleased about. Wood Island Station is a “Duluth Type” which is a specific architectural design first built in Duluth MN in 1894. There were only 28 of them ever constructed, and only 12 remain. In Maine there is only one other Duluth Type station besides Wood Island. It is in Biddeford Pool but has been substantial converted to be used as a private home. Wood Island Station is not only of a rare architectural type, but it is very special because the site of that small island was used in a unique way. Instead of the doors to the boat room facing towards the ocean on the same side as the watch tower, as is done in every Duluth type station – and in every life saving station of any design – Wood Island’s boat room doors open to the rear of the building. This is because the water to the north is more protected than the water to the south. This is the only life saving station that has such a design. What is even more noteworthy, through the research for that application it was learned for the first time that Wood Island Station is the last remaining life saving station of any design anywhere in the USA that has a marine railway. Obviously restoring not only the station but also the marine railway would be a very rare and exciting thing. It is fair to say that original research that moved the body of knowledge of life saving stations forward was generated by this application. It was an excellent work product. And the more we learn about Wood Island Station, the more we find how special and important it really is. But at the January 25 meeting, Council was presented with two competing choices. A version of the documents from the Town’s Attorney, Duncan McEachern, and version of the documents from WILSSA. After significant support was given by residents during that meeting and after showing that the concerns of the attorney were not significant, the Council voted to pass both contracts supported by WILSSA 4 – 3. It was a close vote and a disorganized and divisive process, but thanks to a majority of the Kittery Town Council, WILSSA came through with the contracts it had requested. And the timing of that vote was critical. Without approval that night there would have been no way to advertise the bid package to the public and be ready to start the work in the spring. Without a spring start, the amount of time necessary to do the work would have run out before the heavy weather of fall arrived. It all came to a resolution in a very unlikely way. Tom Haas is a philanthropist who had heard of the Wood Island Station project and expressed interest in visiting and learning more. He came to visit on May 8, 2017. The following day a site visit was planned for interested contractors willing to bid for the work. With great humility, Tom asked if he could help since the Park Service $200,000 had been delayed. He offered to pay for the needed $200,000 on the spot. The site visit went ahead as planned and a contractor, Don Walden, was soon selected to get to work. A total of $450,000 was raised and spent in 2017 bringing the total expended on Wood Island’s restoration to $1.2 million. Tom Haas returned in October 2017 to see the progress that his generosity had allowed. He was really pleased to see the exterior looking brand new. He was also pleased that WILSSA had managed the project to within a few thousand dollars of its intended capital budget of $400,000. The windows, doors and shingles all installed as well as WILSSA’s ability to perform so professionally showed him that his decision to help WILSSA out of a jam had been a good one. He offered to help with additional funding. A new grant from Tom Haas for $250,000 was announced in February of 2018. This timing was critical as the many materials needed for the Guard would need to be purchased. WILSSA had finalized the design using Duncan Mellor for the north wall. It would have 270 blocks each weighing 3200 pounts. Another 630 tons of rock (353 cubic yards) would be used behind the wall to rebuild the north area of the island that has been lost to erosion. Of course, the logistical challenge of transporting approximately 1000 tons of rock and block was quite daunting. But it was also a really fun challenge. Also planned for the Maine Guard was the work to rebuild the historic shed that will be used for a generator to power the electrical needs of the Station as well as a handicapped accessible bathroom. The Guard would install the electrical and plumbing systems for the buildings in June of 2018 as well. The many last details of the approval for the project were secured through the fall and winter of 2017 / 2018 from the Kittery Planning Board. Although far from a smooth or easy process, there was strong consensus among the Planning Board that Kittery’s Building Code allowed for the Station to be used as a maritime museum for the public. They also agreed that Code permitted overnight stays and that the Station could be rented. In short, all of the complex elements of the January 25, 2017 Concession Agreement have been reviewed and confirmed by the Kittery Planning Board. With a few small exceptions (building permits), there would be no more permits or permissions needed from state or local entities to fully restore and reuse Wood Island Station. The final design for the pier has been completed and all permits for that work are in hand. Still to come, of course, is a rebuild of the south sea wall, the construction of the marine railway and the finishing the interior of the building. The Maine Guard has confirmed that they are ready to return in the summer of 2019 and take on as many of these tasks as time will allow. So, obviously, additional sources of funding will be needed in the days ahead to allow that to happen. But it is wonderful to know that the remaining hurdle to a successful project is money only. Raising the last of the capital needed won’t be easy – but the challenges of stopping the demolition, finalizing the complex contracts with Kittery, raising the funds secured to date, and then actually doing the work of restoring the building are all behind us. The value of the Guard’s labor in 2018 was $623,000. Another $400,000 was raised and spent on materials and other expenses. The Guard labor in 2019 is estimated at $600,000 and a similar amount, at least $300,000, will be needed for materials. Adding the $1 million spent in 2018 and the $1.2 million spent since October 2013 – the total for this project now equals $2.25 million. Add to that the value of the Guard’s donation in 2019 and the materials to go with it and WILSSA expects to have spent, roughly, $3.2 million by the end of the 2019 summer. The total cost of the restoration is becoming more and more clear and precise as we gain experience with the project. That total is expected to be $4.2 million. That total price includes an exact replica rescue craft ($250,000) and the marine railway ($250,000). Can the additional funding be secured in time to complete these items and open the museum in 2020? The past success seems to indicate it can. We are certainly working hard to meet that schedule. Wood Island Station will be restored fully, opened to the public, and maintained at no cost to the taxpayers of Kittery. WILSSA will have relieved Kittery of a serious liability while creating a real benefit for the community for years to come. And along the way, we have all come to understand how special Wood Island Station really is. The hard work of saving Wood Island Station will soon be on display in a lovingly restored historic life saving station with a functioning marine railway and replica rescue craft. If we are exceptionally fortunate, this restoration can be completed in the early summer of 2020 and the building open to the public in the late that summer. Our hope is that this historic preservation success will encourage others in Kittery to cherish and preserve the many other historic properties in our community that are, from time to time, in jeopardy.